Chef Laudico’s fresh takes on Filipino food, sometimes fusion, often inventive and always out of the ordinary have garnered him accolades for several years. He is a true kitchen fiend, having started at the “bottom” and working his way up the ladder through various restaurants over the decades. I had eaten at his Bistro Filipino in Fort Bonifacio a couple of times, and while I always appreciated his often refreshing take on things, I guess I just craved recipes that were more basic and pedestrian most of the time. But that didn’t stop me from appreciating his talent, first at restaurants that I didn’t even know he had worked at like Primavera in Greenbelt many eons ago, to Carpaccio of the Werdenberg Group of Companies. I enjoyed his food as a caterer in his early days back in Manila with his young wife at various private homes and I have worked with him in passing on a television show or two and most recently, the filming of an episode of Amazing Food Challenge – More Fun in the Philippines. So it was a bit of surprise when a friend sent me this wonderful looking hard-bound book, and I wondered how I could have missed the publication of this book over two years ago! Turns out it isn’t distributed through bookstores… and I don’t attend most book or restaurant launches, so I just didn’t hear about it! Several of the recipes look more complicated than they really are, and there are quite a few that a home cook might want to attempt. Personally, I am happy to have this book amongst my collection of 600+ cookbooks, and real enthusiasts out there or foodies who enjoyed Chef Laudico’s dishes at Bistro Filipino might want to take a look at this book in more detail. It isn’t for traditional or classical Filipino recipes, but it will make you think twice or thrice about how to tweak your own pinoy recipes and discover a new way to prepare and enjoy your food. Also, if you are interested in acquiring the book, Ms. Johnson has graciously offered a 25% discount to Marketmanila.com readers if you pick up the book from her SOUMAK showroom in Makati. 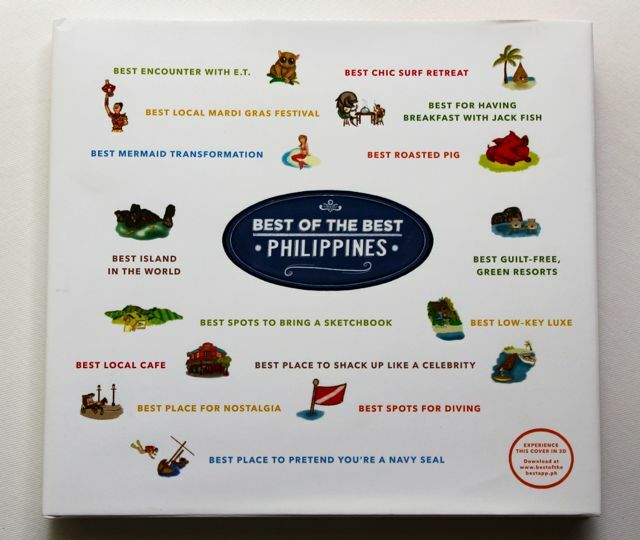 Metropolitan Avenue corner Zapote St.
Another book you may want to browse through is this light guide to the “Best of the Best” the Philippines has to offer. Published by Simeon (Jun) Ventura at Eastgate Publishing (that also publishes Mabuhay Magazine for Philippine Airlines) in cooperation with the Philippine Department of Tourism, this book was primarily intended for distribution to visitors, dignitaries, Philippine consulates abroad, tourists, hotels, etc. 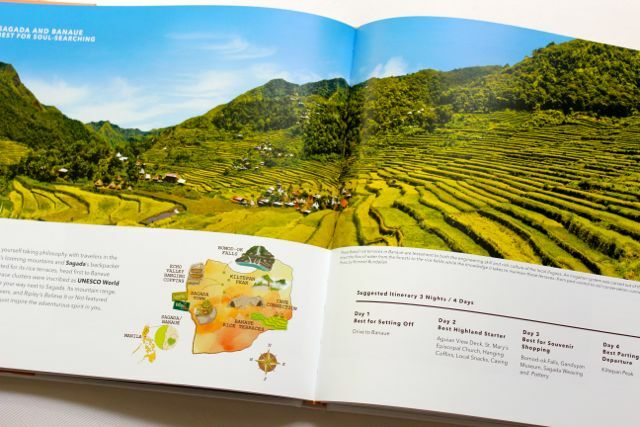 The book details 22 destinations or areas in the Philippines, complete with suggested itineraries and maps to guide the visitor. 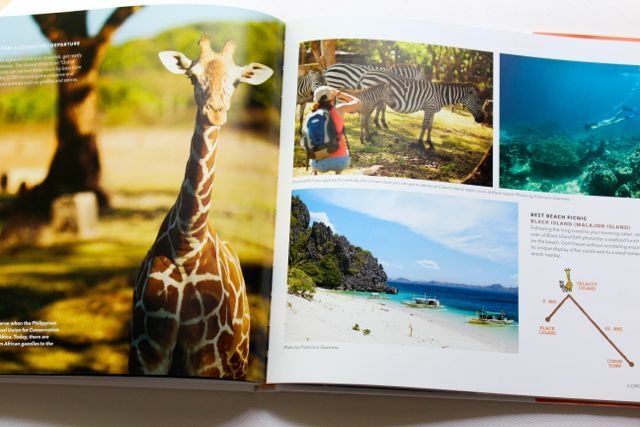 From Boaracay’s white beach ranked amongst the top in the world, the book meanders through one of finest shaped volcanoes at Mayon, diving amongst whale sharks, best spas, stunning rice terraces, best hotels, etc. And Zubuchon is mentioned as a must eat in Cebu to boot! Naks! 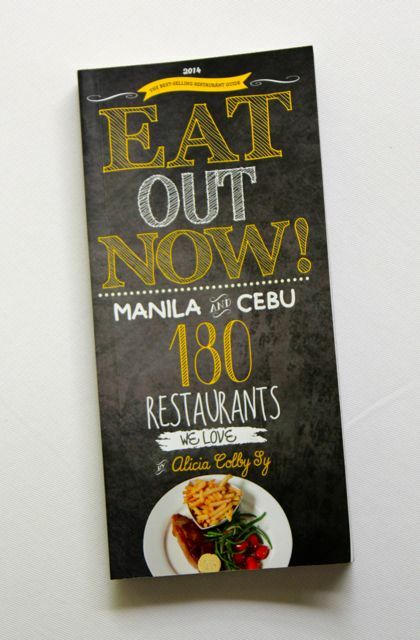 Last but not least, I completely forgot to do a post on the second edition of Eat Out Now, a short but terrific guide to the good places to grab a bite in Manila and Cebu. Published last November, it has expanded its list of metro restaurants and yours truly contributed with a section on Cebu. Available from most major bookstores, I understand it flew off the shelves the second time around. I suspect work on the third edition will start in a few months time… My modest fee for writing a little blurb and helping with vetting the list was donated to The Carewell Community Foundation for support and assistance for cancer patients. They were also my beneficiary for the first edition’s fee in 2013. So I don’t get or gain anything personally if you buy this or any other books mentioned in this post. Happy browsing! Would like to know more about pinoy dishes featuring pigeon. My neighbor used to have them as pets and never thought they could be eaten as well. Thank you for this great list MM, would like to get any one of these soon. Promotion is the lifeblood of commerce. Peculiar that the publishers of the first two tomes seem to have never heard of giving away copies for review. If I were publishing a book about Filipino food, you Marketman would have a review copy even before the galleys dry and a pile of them to give away to a few lucky fans of the blog when it hits the stands. More peculiar still about Filipino book publishing are the advertisements inter-leavened in the text pages. Not a grateful acknowledgement say, of a sponsor, not even a judicious and strategic product placement but worse, actual irksome and irrelevant promotional material in the body of the book. A total turn-off. Nothing but nothing at all makes my esteem for a book fall into abatement and low price, even in a minute than ad pages between its covers. Thanks for posting this info. I’m a big fan of Chef Laudico and had a chance to sample his cooking when I visited in 2011. Was very impressed with his creativity. All cuisines go through an evolutionary process, when someone takes it up a notch or tries something new. I’m sure traditionalists were aghast the first time somebody added soy sauce to adobo, or when that Mexican nun in Puebla added chocolate to the mole she was preparing for high officials (unheard of until then). Today adobo with soy sauce is considered standard, and mole poblano wouldn’t be mole poblano without that bit of chocolate. Accepting change is difficult for some, but I predict that in 20 years all the innovations in Filipino cuisine we’re seeing now will be everyday stuff. I’ve always found chef laudico’s style as a bit “trying too hard” and dated. Sometimes his style seems like he does dishes like a modern take on a sinigang just to say he did something creative but yet he didn’t really push any boundaries with it and sometimes it seems like he even makes a certain “classic” worse. I think it’s chefs like him that sort of hinders the progression of Filipino Cuisine. I can only imagine how far our cuisine could go with “modern twists” of a sinigang, adobo, or sisig… which is to say not really far i think cause it has plateaued with these chefs. I think the next step for Filipino cuisine would be using the base flavour profile of our native cuisine which have very defined acidic, sweet, and bitter flavours and using that to make a new kind of dish and not just another rendition of an old classic. This is my personal opinion on these kinds of chefs and why our cuisine has been stagnant for more than a decade… take it with a grain of salt if you please but i think we should move forward and not get stuck just like the french has moved on from heavy sauces and the British from the heavy meals of an all english breakfast and such. Focus must be on the produce and technique while still being aware of tradition and culture. All look like good recommendations, and I can fifth the suggestion that Bistro Philippines (title?) is quite good. Much as I love Filipino cuisine, presentation of the food is always the biggest problem for me as a cook–too often, despite the awesome taste, it is bowl after bowl of brown or greenish/yellow glop given the tendency to stews and soups. I appreciated some of his clever ways to dress up the plating with his fusion efforts. As for marketmanilaman’s preference for the old standbys, I understand the preference. 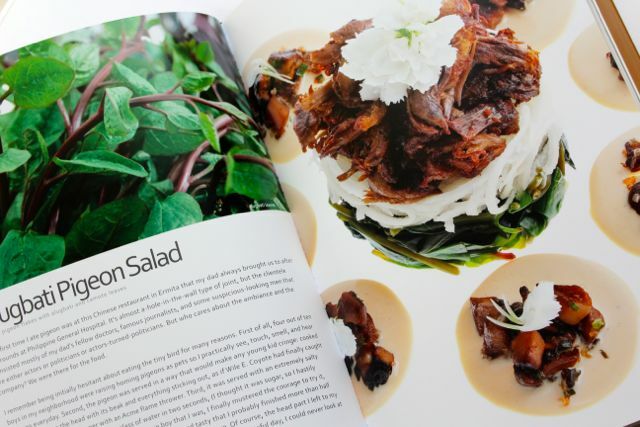 Alas, as I wander through Filipino cookbooks, my biggest challenge is keeping true to the culinary norm even as I attempt to make the dish healthier, less laden with sodium, fats, and sugar. If I fail in this, then I need to limit my consumption of Filipino cuisine to, as my wife has suggested, perhaps once a week for a sodium and fat hit. The cookbook The Adobo Road by Marvin Gapultos has some nice takes on the classics. Jesse I would have to agree with your opinion that its about Filipino flavors. That should be the basis of launching our cuisine to a larger audience instead of dishes. In fact, that trend is happening now. 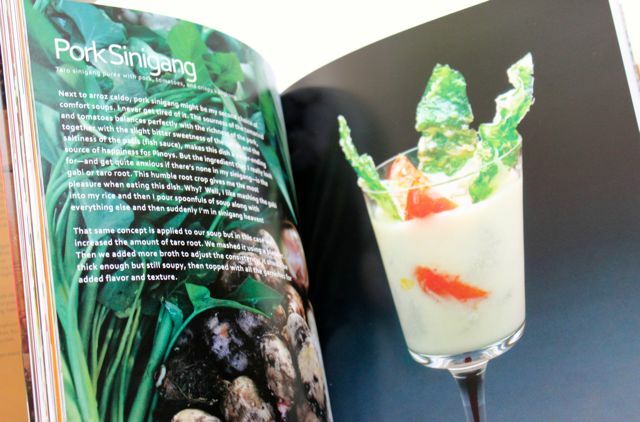 Western chefs are featuring or exploring Filipino ingredients and cooking techniques with many of their creations being offered on menus. For example, higher end restaurants in the California central valley sometimes feature ingredients such as calamansi in their deserts. Another take is a local cupcake vendor who introduces Filipino flavors such as ube along with traditional cupcakes. At the same time, more and more Filipino products are appearing on mainstream grocery shelves and not all of them directed toward the Filipino market. Costco in the Bay Area has Philippine Brand dried Mangoes on the shelves and many bags of the same are in the carts of any shopper. 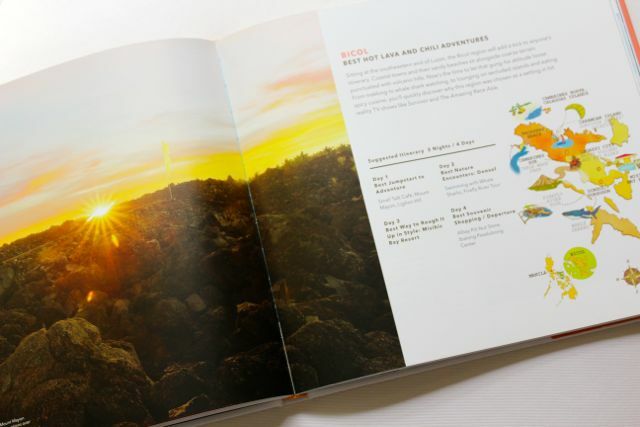 Even before a well known food celebrity heralded Filipino food as the ‘next big thing’, that NPR did a story on a trade show in San Francisco and the purveyor they followed was a Filipino food company. So the interest is there! I have to take exception though to your comment about chefs and pushing boundries. If there is a complaint about Filipino food in a restaurant setting, its often about presentation, execution and service. All three are mentioned from the turo-turo, bakeshop and the sit down. Its in this area that owners and managers really have to drill down and think about when trying to appeal to a wider clientele. Especially to those who wish to elevate Filipino food to the level of fine dining. There are, of course, those who would balk at the presentation of familiar dishes in elaborate settings. 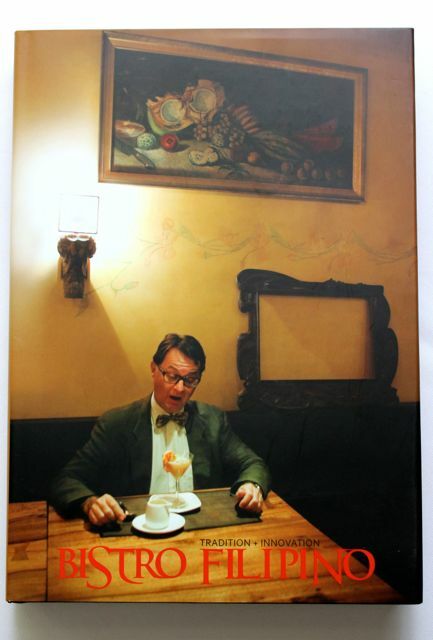 But you have to remember that dining is also about the experience. If there is a disconnect within the three, then pretty much the food will take the downfall too. At the same time, all cuisines have their traditionalist. A good example is the Indian dining scene here in Silicon Valley. Many 3-4 star Yelp! reviews of an Indian establishment is often followed by one star reviews written by Indians. Many of the reviewers citing ‘not authentic’ or flavors not to their liking. As the joke goes with the Filipinos, Indians also say ‘food is better at home’. And that where it starts with detractors whether you are Filipino, Indian, Vietnamese, etc. Its the flavors and experiences that you grow up which dictate your opinions. The other thing that we need to get beyond with our cuisine is its balutification and really get to know its knowledge within. Often with young people, eventhough they grow up eating it, they cannot explain what’s in it or ‘ashamed’ or embarrassed to tell what it is. Filipino food is pragmatic as it is delicious. Other descriptions I have recently read/heard from food writers is that its folksy, earthy and peasant. To me, its honest. I can’t totally poo-poo the use of conveniences because of the fact that flavor packets and canned foods were a costs and time saver for many Filipino families back in the day. When both mom and dad worked and dinner had to be on the table, it was easier to just put on a pot of rice and open a can of Spam and maybe scramble up some eggs. If you had extra time, boil up some leafy greens, chop some tomatoes and bust out the bagaoong. Not only are those the flavors you remember, but the memories. Its that embrace of nostalgia that holds Filipino food back to a certain degree and why some ferociously defend it. But Filipino food is beyond that. If you are a restaurant owner or a gastrophile who enjoys cooking and entertaining, you have to be willing to go beyond orthodox or perceived notions of traditional/cliche (its brown, salty, oily, unhealthy, greasy, blah, blah, blah) and discover what lies ahead. After all, for better or worse, Filipino food as we supposedly know it today is influenced by the west. Actually Chris J there are recipes for healthier versions of Filipino fare. 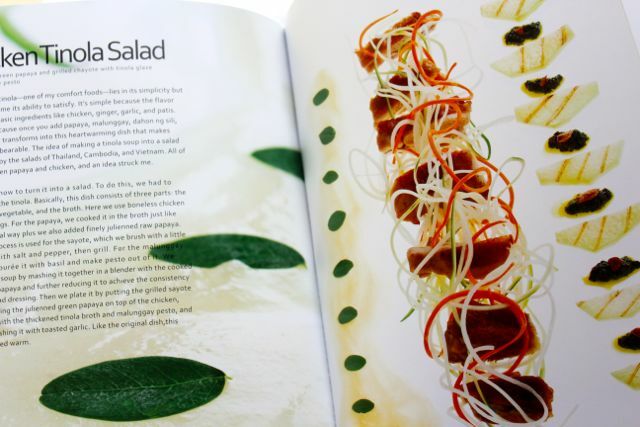 You wan’t necessarily find them in mainstream cookbooks, but health/medical advocacy groups such as ADA. Many of these groups have resources on making healthy versions of many ethnic diets. A report written by the University of Hawaii in the 1940s examined Filipinos living in the islands and noted that the traditional diet (native) foods are healthier than the western diet that they were becoming accustomed to. I totally agree with you Getter Dragon. Let me put it this way… the reason why i don’t like chef laudico’s style is that if you’re gonna try to make sinigang modern think of another way to make some sort of souring agent, be able to think what will remind you of sinigang but in a totally new and different way. If you’re just gonna stand there and start making traditional sinigang broth into a gel or sphere or whatever… then you have done nothing to give justice to the classic sinigang as far as i’m concerned this method does not respect the cuisine and the customers. I want chefs to explore a totally new way of combining flavours but in a way that it still touches are main flavour profiles. Don’t just start making adobo glaze and call it a modern twist(just an example of how some of these guys take it too far with what they call “a modern twist”) if you made adobo glaze out of your typical adobo broth/sauce then what have you done exactly to modernize it? I think one of the guys who actually did well to elevate Filipino Cuisine was chef Bruce Lim because he didn’t try to make a “modern interpretation” but instead he made his own interpretation of local dishes. He didn’t cook them in a way just for the intention of making it modern but he gave people back then a glimpse of what filipino food could be. Unfortunately his Chef’s Table venture didn’t pan out… I guess people 3-4years ago were just not yet ready for his style of restaurant and cooking. Jesse, I dig what your saying. Referencing my previous comment, yes that the focus of Filipino food within the western dining scene, particularly in Hawaii and SF Bay Area, that its all about the flavors and not necessarily modernization. I was pleased to learn of a Top Chef alum and his new restaurant on Maui with his simple offering of chicharrones as an appetizer and dessert of Ovaltine chocolate cake. Traditional and reflective of flavors that we can relate with.